Pongal Event Center offers one of the best values for your celebration because we offer the most competitive rates in the greater Albuquerque, NM area. Pongal Event Center rates are based on demand, and since Saturday evenings are the most popular for all types of events, they demand the highest price. However, compared to other area event venues, even our Saturday evening packages are extremely affordable. Available packages for other days and times decrease in cost. Please contact Tom, our event coordinator or Jef, our planning pro for more details. Additional venue time depends on previously scheduled events. Our event coordinator will let you know what customization options are possible with your selected date and time. 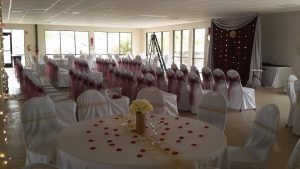 Additional decorations and supplies may be rented, and you can get as much or as little assistance as you need from our experienced event planner. Please contact Elaine for information about event planning packages and pricing. Pongal Event Center offers the best value for your celebration. Contact us for information on our customizable packages today!